The T10687 is sold as the saw only. Please see T24872 for the Guide Rail and T25094 for the Accessory Pack. The T25552 Master Pack includes the Saw, Guide Rail and Accessory Pack. 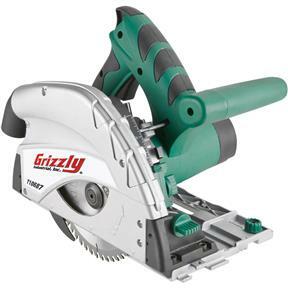 This track saw redefines the circular saw, making traditional circular saws obsolete! Its plunge-cutting action eliminates flip-up blade guards and its riving knife reduces the risk of pinching and kickback for a new revolution in safety. 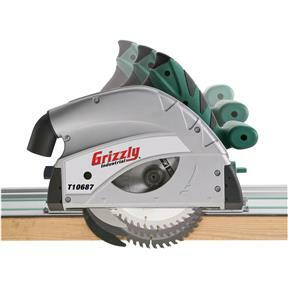 And, although this saw cuts like any other circular saw, the optional Guide Rail is indispensable for making straight cuts when cutting wide panels. 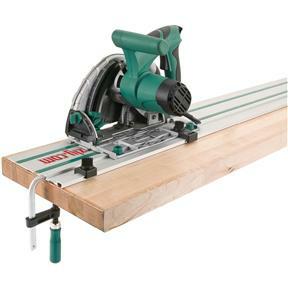 No more unsafe, over-extended reaching, and poor balance while cutting wide panels on a table saw! 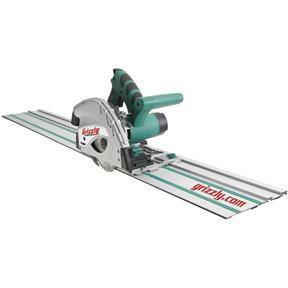 Once you use this Track Saw, you'll never go back to your old circular saw! Suitable for a variety of materials like solid wood worktops, double-coated MDF boards, etc. 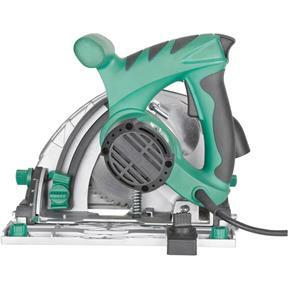 Max cutting depth at 90°: without rail 2-5/32", with rail 1-31/32"
Max cutting depth at 45°: without rail 1-5/8", with rail 1-7/16"
Distance between saw blade and wall: 5/8"
Guide Rail T24872 and Accessory Pack T25094 must be purchased separately. Glad to see Griz/Schepach have fixed the issue with the slip tape being too close together. Mine came with the two strips of tape spread just about as far apart as possible so no rocking side to side. Got the cams set and the saw runs very well on the 55" track. Test cuts and the supplied blade is about as you might expect -- a blade to use until you upgrade. Swapped it for the Freud 160mm x 48T x-cut blade and it is much better. Even some dried out old cheap plywood is getting a nearly perfect keeper side and a reasonable off-cut side. A strip of blue tape to cut through and it gets just a bit better. Plywood and MDF. Have not tested with melamine or real "tree meat" yet. Blade was square to body out of the box. Depth gauge is more of a depth suggestion but good enough. Haven't tested angle settings since all I've been doing are square cuts in plywood and MDF. Cover up the port on the side and the hole that can expose the riving knife adjustment screw head and the dust extraction is much better. The manual recommends 100CFM. A medium size ShopVac (which is no substitute for a proper dust extractor but works in a pinch) is around 120 to 140 CFM and seems to do a good job once you bodge the hose connection. Loud universal motor. Use ear protection. I am making shop cabinets from 4x8 sheets of plywood. This saw makes cutting the sheets into usable and finished size almost fool proof. Cut is clean, not ragged. Works well.